A well-managed classroom promotes a productive learning experience. Classroom management is the act of managing time, space, teaching tools and students to create an effective learning environment. There are many ways to manage these elements of the classroom. Some are effective and other ineffective. Understanding the difference between effective and ineffective management techniques can help you gain control over your classroom and will facilitate a better, more productive learning environment. Take a proactive approach to bad behavior. Taking steps to prevent common behavioral issues in the classroom helps avoid losing valuable time dealing with behavioral issues. One effective method for accomplishing this is to start the school year with a list of rules. Involve students in setting the rules and the consequences of breaking these rules. Review the rules at the start of each school week. Continually explaining rules and consequences as each student disrupts the class is ineffective because valuable time is spent dealing with individuals as opposed to the organized approach of addressing the group. With a set list of rules and consequences, students know what to expect. Corporal punishment is a type of punishment that involves physical pain. Paddling is no longer considered appropriate and is banned in most school systems. There are many reasons corporal punishment was deemed ineffective. One of problems with corporal punishment is that it addresses only the behavior and not underlying causes for the behavior. Corporal punishment can also cause a lowering of student self esteem and sets up a situation where the student does not like school. Rather than stopping bad behavior, corporal punishment can reinforce it. An effective and alternate method of punishment is the parent and student conference, which gives teachers the ability to address concerns directly with the student and parents involved and to work cohesively from both the school and home settings to employ a more rounded method of bad behavior consequences. Controlling the seating arrangement and developing activities that encourage students to work together can be an effective way to help ensure your students get along. 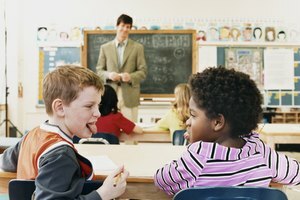 Forcing students to interact with their peers is ineffective and doesn't accomplish the end goal of a classroom environment where everyone gets along, but creating activities that teach students how to respect others and appreciate the differences of others can encourage a better working relationship among students. Keeping a positive atmosphere in the classroom begins with the teacher. Keep a positive atmosphere by highlighting good behavior and rewarding those students who follow the rules of the classroom. Go out of your way to keep personal troubles out of the classroom and show that you are happy to be there. Model the behavior you expect from your students. This atmosphere can make being in the classroom enjoyable for students. Letting students see you as moody or aggressive can undo all that you try to achieve. Don't make it personal. Don't get angry. As a teacher, your job is to look out for the good of the entire classroom. If that means removing a student from the classroom, remove the student and refer to the consequences as they apply to your classroom and the situation. Being sarcastic toward a student or engaging in a power struggle are also ineffective responses. The rules and consequences are outlined. Adhere to them and be consistent. Hose, Carl. "Effective & Ineffective Classroom Management." Synonym, https://classroom.synonym.com/effective-ineffective-classroom-management-10019478.html. Accessed 21 April 2019.